Report calculator is a tool to calculate and further process on the report results. The report calculator allows business personnel to process the report result independently so as to tap the potential value of reports, and make the report in rather rigid formats become versatile to confront the changing demand rapidly. Report calculator for desktop BI should support the export formats generally supported by the reporting tools, for example, the text file and Excel spreadsheet. It should be able to support various intuitive data manipulation methods, allowing users to process the data conveniently and rapidly. Plus, such tools are expected to provide business-personnel-oriented UI, making it possible for users to complete the computation independently without having to rely on technicians. esCalc is just such a report calculator. 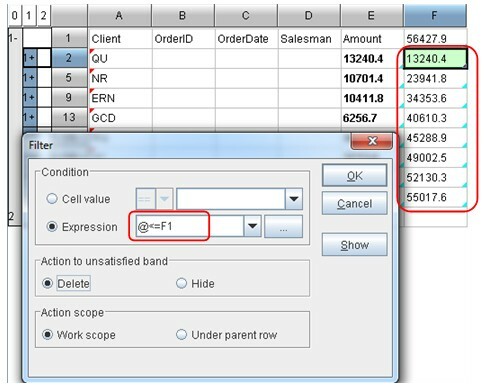 The application scenarios of report calculator are given in the below example. In a certain business report system, the query and presentation of orders in a given period is provided. The reporting results include Order number, Order date, Sales person, Clients, and Order value. Now, it is time to make statistics on the big clients accounting for 60% of sales in the recent half year. Because such calculation result is not provided in the report directly, and it is too pressing to request the developers to calculate in this case, business personnel will have to calculate all by themselves. Business personnel will firstly query on the order data of the recent half year in the reporting system; secondly, export report results and import them to esCalc; thirdly, with several simple steps, achieve the computational goal, and print it out with the pie chart. Based on the reporting result in an Excel spreadsheet, calculate the increment of the year-on- year monthly sales. Based on the text file exported from the sales report, calculate the sales persons whose monthly sales are ranking the top 3. Through the table of website visitor volume, calculate the channels whose visitor volumes are among the top 10 in the consecutive 3 weeks. Based on the report results of a telecommunications company, calculate the changing tendency of the average contribution of each customer during the Christmas season. The text file and Excel spreadsheet are the commonest file formats. Almost all reporting tools support these two patterns, and most reporting results are the tabular data. Therefore, esCalc can handle the various reporting tools that the business personnel encountered in their daily work. Fourthly, sort. 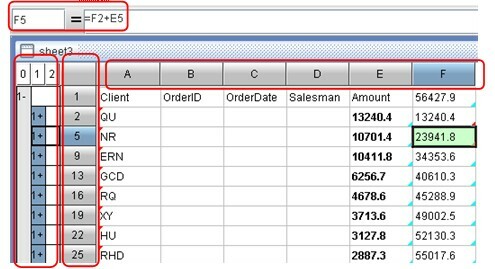 In any cell of column E (except for the column header), select Desc on the right-click menu and the data will be sorted descendingly, as shown in the below figure. Each step described above can be completed in one action. In each step, users can monitor the result of the previous step, based on which, the computation can be carried on. This operation mode is designed on the basis of the findings on business personnel operation habits through a great many of studies, and is referred as Calculator-style Operation. The Calculator-style Operation allows users to calculate independently without having to resort to technicians. Users can thus consider the problem according to the natural train of thoughts, and decompose a complex problem into several simple steps. Considering the arbitrarily data processing, first and foremost, the processing method must be easy-to-use and strong. Users should be able to perform any processing on the data, and required to perform the minimized types of operations. Through a huge volume of demonstrations and tests, esCalc implements this functions through visualizing and proceduralizing the SQL syntax, including sorting, grouping, query, distinct filtering, and vertical or horizontal merges. 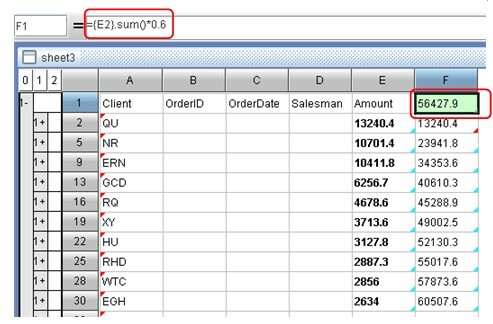 The greatest difference from SQL is that the data is processed through the detailed and visualized menu and operations. The complex and hard-to-understand scripts language is not a must any longer. The arbitrary data processing also refers to free transition between various processing methods. For example, for Excel, the level of difficulties between sorting-before-grouping and grouping-before-sorting vary greatly, whereas they are both simple for esCalc. 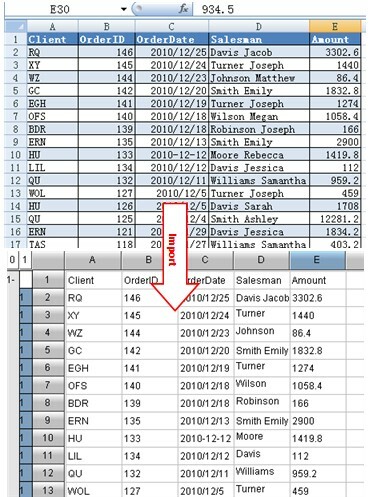 Similarly, esCalc allows users to add the calculated column to the grouped data, or conduct the further summarizing. In addition, esCalc also supports the filtering, sorting, and other operations on the grouped data arbitrarily. From this step, we can see that esCalc not only supports the grouping, computational column, inter-row computation, but also the arbitrary inter-row computations on the grouped summary value, or adding the computational columns. As can be seen from the above steps, esCalc supports not only the summarization expression, but also the further summarizing on the grouped summery value arbitrarily. From this step, we can see that esCalc not only supports the filtering, but also supports the further filtering on the summery value after grouping. For esCalc, it adopts the more advanced tabular computational module, which enables the business personnel without technical background to leverage the data processing capabilities as strong as SQL. In addition, it guarantees the smooth transition between any operating steps. The arbitrary data processing allows business personnel to operate on the data freely in a natural brain of thoughts. This greatly strengthens the analysis ability of business personnel to confront to the complex and pressing computational task. As can be seen from the above figure, esCalc has the column named after letters and the row named after numbers. Every cell has a unique cell name by which they can be referenced to each other. The formula syntax is similar to that of Excel. When constructing the levels, the cellset can be folded to the left or expanded. 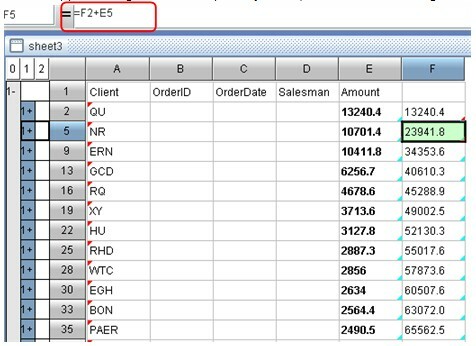 One thing to note is that the direct calculation of the summary value of column F is not supported in Excel, so that there is no column F in the Excel sheet shown above. Excel users will have to copy and paste it to another sheet to calculate over again.